Everyone makes mistakes. I believe mistakes are important in that they can teach us lessons we will not soon forget. When you learn something the hard way (by making a mistake), it may be the best way to learn a lesson. I think the second best way is by watching someone else make a mistake, which I suppose, would be learning something the easy way. When it comes to my investments, however, I am happy to apply lessons learned no matter how I learned them. Throughout my financial advising career, I have seen many people learn financial lessons the hard way. Therefore, I would like to share with you some of the most common mistakes I have seen investors make, in the hope that you can learn from them the easy way. Paying too much in fees. If you pay high fees for your 401(k) or other investments, they can severely impact the amount of retirement savings you will have. Let's look at the following chart based on a recent article by The Motley Fool. 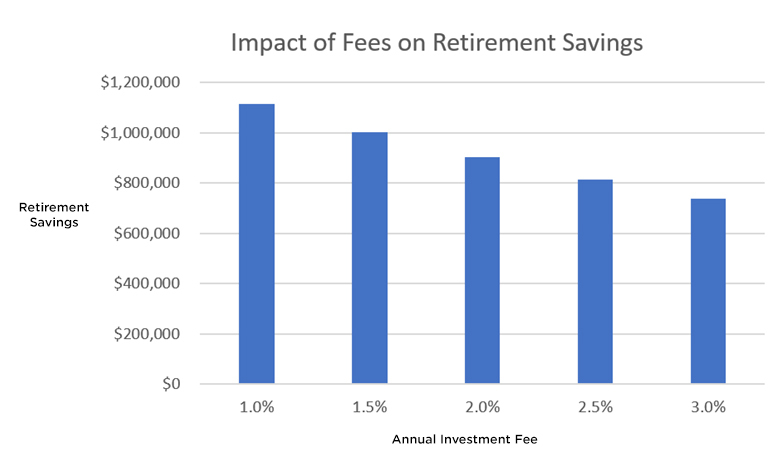 Assuming you contribute $10,000 annually to a 401(k) from age 30 to 65 and earn a 7% return before fees, you could experience a decrease of as much as $377,825 in your taccount balance simply by paying too much in fees. Not paying for quality investment and financial management services. I recently heard a client tell me that a certain group was willing to manage his investments for "free." These robo-advisor platforms charge rock-bottom management fees and provide minimal human contact. They depend largely on mathematical rules and algorithms to provide digital financial advice. I believe when it comes to your financial situation, one size does not fit all. I also believe you get what you pay for in life. When I get financial advice, I want it to come from someone I trust who knows me. In turn, my goal is to provide excellent service to all my investing clients for many years to come in a fair and transparent way. There is, of course, a certain amount of risk in investing. The best way to minimize that risk is to diversify your assets. You can achieve diversification by investing in assets that include exposure to various industries, company sizes, and geographic areas. That way, when one asset class performs poorly, one of your other asset classes will probably be doing well and offsetting any losses you are experiencing in the first asset. An easy way to diversify is by investing in ETFs (exchange-traded funds). Confusing past performance for future results. Another common mistake investors make is to chase performance. If there is a hot stock, many investors tend to pull out of other investments and pour money into the hot stock. While past performance can be helpful in analyzing an investment, you want to be sure you are considering performance over a long time period, such as ten years or more. While there is still no guarantee, a long history of solid returns is better to consider than just a year or two. It's not easy to watch the markets (and your account balance) drop, feeling helpless to control it. It is natural to want to do something about it. Whether you are experiencing fear and anxiety over your portfolio losses or confidence and elation over your portfolio gains, it is important to recognize when your emotions are taking over. A Morningstar study found that "during periods when the underlying mutual funds compounded at 9%, 10%, 11%, the actual investors in those funds only made 2%, 3%, and 4%, because they were constantly buying and selling at precisely the wrong times, allowing their emotions to control them rather than taking a long-term view of investing." If you are invested in the right strategy (conservative, moderate, aggressive) for you, you do not need to pay attention to the ups and downs of the market. Expect that there will be a certain amount of volatility and ignore the noise, confident that you have done your homework when it comes to investing. Perhaps you have made some of these investing mistakes already. Regardless, I am here to help you recover from lessons you learned the hard way and guide you with lessons you can learn the easy way. I can help you research the amount of fees you are paying on your investments, diversify your portfolio, analyze investment choices, and choose an investment strategy that will help you sleep at night. Let's change these mistakes into learning opportunities and become better investors in the long-run. 5 Money Mistakes that Could Cost you a Fortune. The Motley Fool. December 25, 2018. The Balance. January 19, 2019.